How Likely Are You to Make Money With eBooks in 2010? It's a new year. What will happen? More to the point -- how likely are you to make money with eBooks in 2010? That's the question that a lot of people are probably subconsciously wondering about as we move forward into a new decade and a new year. The best way to figure out how well you're likely to do with eBooks or anything else is to take a moment to examine what your performance has been in the past. If the answer to that question is "not as successful as I would have liked," then you really owe it to yourself to have an honest assessment about the things you did (or didn't do) that resulted in you not achieving your goal. There's no question in my mind that 2010 can be an extremely profitable and exciting year for you as an eBook publisher. The really big question is whether or not you're ready to implement the kind of "smart action" that's required to get yourself up and running as a profitable eBook publisher in the shortest amount of time possible. Here's what I suggest: grab a piece of paper and a pencil. Write down exactly how much money you'd like to make in 2010 -- be realistic! Then, I want you to think about the things you need to do on a daily basis to help yourself reach that goal. One thing you should definitely consider is obtaining a step-by-step blueprint that will show you everything you need to do to make money with eBooks. You will be dramatically cutting down on the amount of trail and error you'd otherwise have to undertake. Here's the bottom line: you're more likely to make money with eBooks in 2010 if you follow a proven system. It's as simple as that. You must get people calling you to ask you to speak. This is where your BRAND is important. Being a speaker opens a lot of money-making doors. There are a lot of income increasing opportunities and most of them are fairly easy to do. Some streams of income can even be set to earn passively. 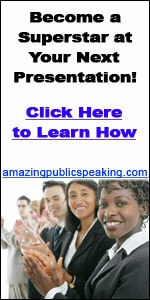 There are many ways to earn money with public speaking. In this article, I will share to you a variety of ways to get rich with your ability to deliver a speech. You may have to speak a few times for free but the goal is to get booked and get steady streams of testimonials, referrals, and income. Of course, the point for most public speakers is to get paid to speak, but an added benefit is that you get to help people with your message. With time other means of income will naturally branch out from your speaking skill. As a speaker you must become a shameless marketer. You cannot get the bookings you desire if you just sit in your home waiting for things to happen. Your step to become a wealthy public speaker starts with your marketing skills. Being public speaker means that you have an expertise over something. If you are getting your fair share of bookings, then chances are, you are already regarded as an authority on a particular subject. You can create products relevant to your topics and sell this to the public. Commonly these products are books, CD's, and other informative resources. You can earn passively with this by making your sales online. There are some instances that a product precedes the act of public speaking. Some people get into public speaking because of products they made or invented. This is a common scenario. These products go hand with your marketing efforts. Successful products create better public image thus getting booked more often. Speakers are highly regarded in their niche. No matter what the niche you are into, you will be perceived as an expert because you talk the talk and (hopefully) walk the walk. People will be wanting your personal services and that is for sure. So as a professional in the field, you can provide mentoring programs for individuals in need of your expert help. You can provide consulting services and package deals for the market to avail. This can be a great source of easy income. You now have products and you also provide consultant services. You are a complete package of expert assistance to the community. The best way to sell your products and services is through the Internet. In your speaking engagements, you can give incentives to the audience by giving them free online resources that are download-able in your site. It makes the people check out your site and they can potentially become a paying member. On your website, you can provide your products in digital form such as e-books and MP3's. You can also market and promote with your web presence. Want to Make $100,000 to $1,000,000 Dollars Per Year as a Professional Speaker? Learn to Make Money Speaking: Become Wealthy or send a completely blank email to bmsoptin@aweber.com. Again from the Walters Survey here are the average fees reported by working professional speakers for different kinds of speeches. The Walters survey showed that the number of available speaking engagements is on the rise.Anyone can do this if they can get the right direction. So much social media, where do you start? Can I make money with a blog? In the packed out preview call tonight, I told our teleclass that to have success in social media you must subscribe to the WIFM channel (What's in it For Me). People really care about themselves more than they can about you. It's not personal, it's just that people want to know what problem you solve or what pain you can take away or how you can make their life easier or more enjoyable. Posting a Comment on THIS blog is step two. (Just kidding). I will be going over all the steps over the next few weeks. I want the Christian authors and ministries to CRUSH IT! Read the books, blogs, click the buttons, be curious and invest in learning and get a COACH if you FEEL overwhelmed! Win in 2010! Put your head in the game. See www.newministrymarketing.eventbrite.com for NEW Social Media Marketing Services division and join www.ChocolatePagesNetwork.com free! www.MinistryMarketingSolutions.com and get free mp3 on What Every Christian Author Should Know. The way you marketed your book, business or ministry in 2009 has got to be different in 2010. PR has changed in case you haven't noticed! It's all about social media and branding online. It's not just about facebook and twitter! It is so much more. Are you ready? Do you need a coach to help you through the maze of new media? We can help your SEO and build your list, create videos, blog ....so you SHINE online and your brand will cash in! See this presentation of the stats of PR 2.0 - the new implications and how YOU must change if YOU want to REALLY WIN in 2010! Crush it! My new video just posted.